Unlike some parts that you can just pick up off the shelf at your local marine and industrial supply store and be on your way, hydraulic hoses require a little more effort. Depending on the use of your Fall River hydraulic hoses, there could be a wide variety of factors that must be considered before replacing old, worn out hoses with something new. Custom hoses in Fall River can be purchased through Metro Industrial. We even create hydraulic hose assemblies and hydraulic hoses while you wait, according to your specifications and requirements. Custom hydraulic hoses are used to transport fluid from one component to another, and they are an integral part of any hydraulic system. Some machines use a metal pipe to transport fluid, but the flexibility that comes from using custom hoses in Fall River enables the components to be positioned more effectively. They can be placed where they are most efficient for use or more convenient for the user, depending on the situation. The hose can bend around corners, make a way through tight spaces, and even span across long distances. Different couplings and assemblies can also be used, along with different ratings for temperature, pressure, and length to meet your needs. 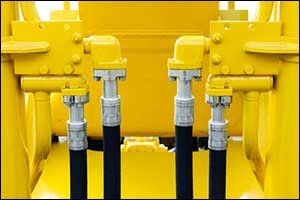 There are many different types of hydraulic hoses and even more types of hydraulic hose assemblies to suit the needs of each application, the piece of equipment, and the user. So while you could just grab some hose off the shelf at your local retailer, it would not be as beneficial as purchasing custom hydraulic hoses that are sized and fitted according to your specifications. It pays to work with a trusted service that can provide you with custom hoses in Fall River. We understand that hydraulic hose replacement can be an urgent situation, which is why we create custom hydraulic hoses while you wait at our New Bedford, MA shop. SAE Industry Standards – The set of standards that governs hydraulic hoses is the SAE or Society of Automotive Engineers. While hydraulic hoses can be used on factory equipment, agricultural devices, trucking industry vehicles, and a wide variety of other applications, SAE has established a hydraulic hose standard which serves as a benchmark in industrial hydraulics nationwide. There are sixteen different hose styles that fall under SAE standards, and each of those styles must meet certain criteria for performance characteristics. It is important to note that SAE does not issue certification or approval options for manufacturers who meet these standards, as conformance is voluntary. However, knowing that your custom hoses in Fall River meet SAE standards is sometimes a critical safety factor for some customers. The modern hose that is used today by industrial, commercial, and agricultural businesses consists of three basic parts. The first is an inner tube that is used to carry the pressurized hydraulic fluid. The second is a reinforcement layer, and the third is a protective outer layer. All of this is designed to create a flexible, yet very safe means for fluid to be transported from one component to another. The inner tube must be compatible with the type of fluid that it will be carrying, so this is a very important step in creating custom hydraulic hoses. Some of the most common compounds used include thermoplastics, synthetic rubber, and Teflon PTFE. The next layer is designed entirely to reinforce the inner tube layer. It is often made from one or more different sheaths of braided material, such as textile yarn, wire, or spiral-wound wire, depending on the needs of the application. After the protective internal layer, the most protective outer layer must be designed. It is typically chosen based upon its abilities to provide resistance against weather, chemicals, abrasives, and other environmental factors. High temperatures, freezing temperatures, exposure to oil, an abrasive environment, and other criteria should be discussed when ordering custom hoses in Fall River. This is why it is important to get hydraulic hoses while you wait from a trusted and experienced provider. Regardless of the quality of your Fall River hydraulic hoses, they will eventually fail. However, proper sizing and the right type of hose being used can extend the lifespan of your hydraulic hose assemblies in the workplace. Regular inspections and ongoing maintenance at scheduled intervals can help prevent failure and allow the user to replace the custom hydraulic hoses before they cause any damage. There is serious risk associated with hydraulic hose failure, including potential life-threatening injuries to the user, damage to the equipment, and environmental hazards caused by spilled fluids. If you are interested in learning more about getting custom hydraulic hoses ordered or having our team of technicians create hydraulic hoses while you wait, give us a call at 508-996-8400. We can answer any questions that you might have about our local Fall River hydraulic hoses. You can also stop by our shop in person, which is located at 435 Coggeshall Street in New Bedford, MA.